There are many special programs that can be accessed running them manually. These programs aren't included in the menu because many are potentially destructive, allowing you to move, delete, clear, etc. data. After selecting this option you'll see a small window with a field to type a program name. This is where you type the program name. We'll usually be the one providing you with the program name, but this may be a program you've used before and you can just reenter the name. 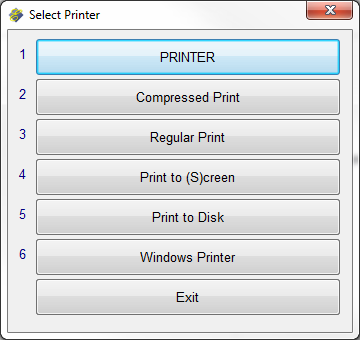 After typing the program name in the field click OK. You'll be asked to select a printer and you should select the first one in the list. Click the first printer in the list.